CHATTANOOGA, Tenn.--(BUSINESS WIRE)--Employee benefits provider Unum (NYSE: UNM) finds the majority of workers (58 percent) want paid family leave from their employers, including nearly two-thirds (64 percent) of millennials. In an online poll of 1,227 working U.S. adults conducted last month, paid family leave outranks other popular perks*, like flexible and remote working options (55 percent), sabbatical leave (38 percent), student loan repayment assistance (35 percent), pet-friendly offices (15 percent), and pet insurance (15 percent). Paid family leave includes time away from work to help new moms and dads bond with children, as well as time off to care for aging adult family members. While not mandated on a federal level, several U.S. states and municipalities have implemented variations of paid family leave laws to ensure employees have adequate time off for caring responsibilities. According to WorldatWork, 88 percent of companies think they need to offer paid family leave to be competitive, yet a 2017 Pew Research Center survey found access to paid family leave varies widely across employers and industries. While most employers want to support working caregivers, balancing the wide range of federal, state and even local leave policies can be confusing and complicated. Unum has created a variety of resources for both employers and employees at a new, dedicated site, which can be found here. The company also offers LeaveLogic to its employer customers, which streamlines the leave process for employers and their employees across federal, state, and local regulations and company policies. *For the purpose of this study, work perks are defined as non-insurance or retirement benefits. Consumers were asked to rank the following work perks in order of preferences: paid family leave, flexible/remote work options, professional development, sabbatical leave, gym membership or onsite fitness center, student loan repayment, onsite healthy snacks, ID theft protection, financial planning resources, fitness goal incentives, public transit assistance, pet-friendly offices, pet insurance, health coaching, and dedicated volunteer hours. Participants could vote for their top five choices. 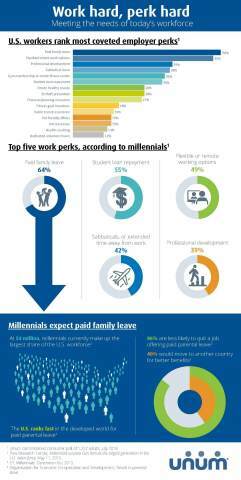 Employee benefits provider Unum finds the majority of workers want paid family leave from their employers, outranking other popular perks.